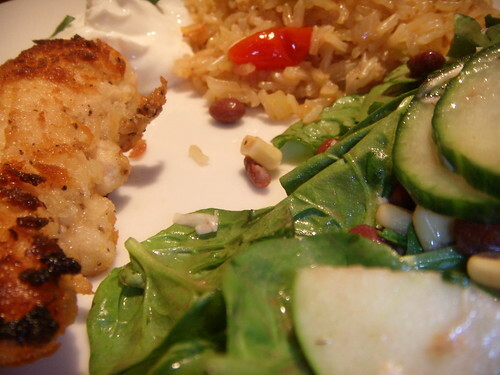 panko crusted chicken, cumin-apple rice, and spinach salad, originally uploaded by aarn! +10th July, 2008+. it was raining out, so the chicken was coated in pankos and sauteed in some vegetable oil on pretty high heat. the brown basamati rice was cracked and cooked with onions, ginger, lemon zest, cumin, tomato, cubed apple, and some sherry. the salad had cucumbers, onion, and cranberries, and was tossed in a black bean and corn dressing. a little strained greek yogurt on the side too. i cook with friends and these are some pictures of some of the projects/dishes/meals/etc. that i have made since january 2008. sometimes other people take the pictures and sometimes other people make the food, usually noted. if you would like more information on any of the food, please feel free to contact me (or drop a comment). i'm not looking for fame or to be recognized as a chef/cook, i have no formal training in the culinary arts and i don't claim to know what i am doing, this is simply a hobby of mine and this blog is a more linear way for my friends and family to view some interesting creations. enjoy! all of the content on this website is exclusive to Lickmybalsamic.com, and should not be reproduced in any form with out the expressed written consent of the owner. some recipes are adapted from noted sources. photographs and text are the property of lickmybalsamic.com.